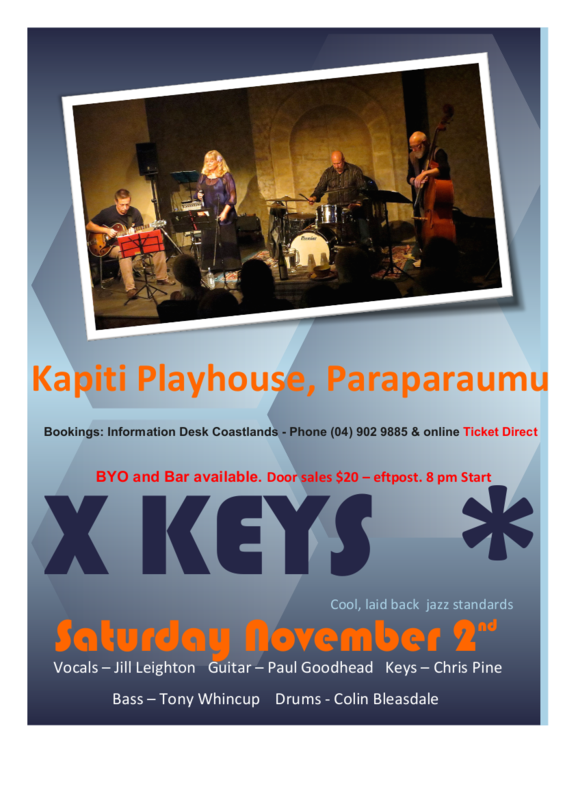 XKeys in Concert - Kapiti Playhouse Inc.
Be at Kapiti Playhouse on November 2nd for the XKeys concert featuring some cool, laid back jazz standards. The concert kicks off at 8pm and tickets cost just $20 and are available at the Coastlands Information Desk or online on the TicketDirect website (please note that extra service fees may apply when booking online). 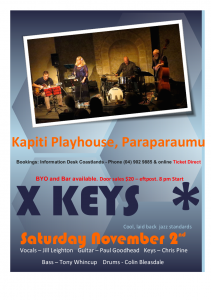 Lembas Café in Ruamati South and now…..
Kapiti Playhouse, we are looking forwards very much to playing at this venue. Vocalist Jill Leighton, has an eclectic musical background that encompasses many different styles. She now specialises in jazz and loves many modern yester-year singers. Bass Tony Whincup, has always played music…it’s in the DNA – he has followed an interesting path from being a youngster in the UK to playing in three different jazz bands currently. Guitarist Paul Goodhead, the master of the strings. Paul brings an absolute wealth of experience to the stage with an appreciation of of jazz that has enabled him to provide appropriate radio commentary at different times. A great guitarist. Keyboard Chris Pine, the “master of the keys” brings a great depth of experience in many varied jazz genres, a pleasure to listen to as he softly keys, appreciating respectfully his way through many well written songs. Chris has a very large understanding of different jazz styles and compliments the other musicians in the group. Drums Colin Bleasdale, again a varied background in musical genres, mostly enjoys the laid back style of jazz that permeates the sole! He appreciates many different styles of music and enjoys playing with quality jazz musos in Xkeys.